NoExcuseList provides you with a selection of some useful resources to help you develop new skills and expand your knowledge. These resources are arranged into 9 categories: Academics, Art, Computer programming, Cooking, eBooks, Music, Languages, HowTo+DIY, and Other. Browse through the collection to check the resources you like. Most of these resources are free, the few paid ones are marked with a yellow button. 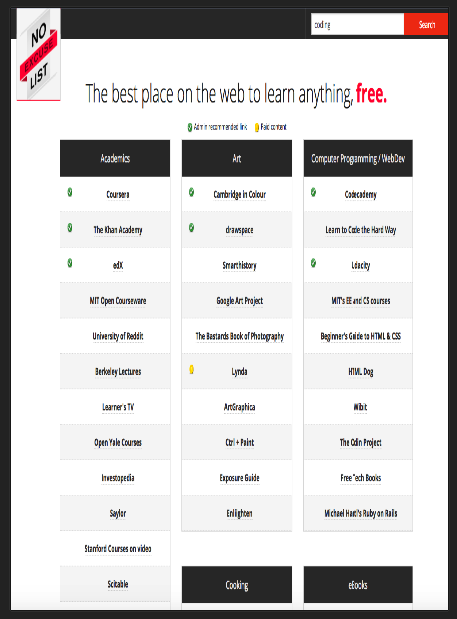 Clicking on any of the links provided in NoExcuselist will direct you to its corresponding website. You may want to spend sometime going through the selection and share with us your feedback.